Looking for the perfect InkJet Coder? Enjoy a fully portable printer that simplifies offline package marking and products marking. With easy to read characters, consecutive numbering, time and date and graphics, the EBS 260 Handjet is the perfect InkJet Coding Printer. The EBS 260 has everything you need for precise, fully mobile number, time, and date stamp imprinting. Store and Imprint multi-line messages for on-demand, Large Character InkJet printing. 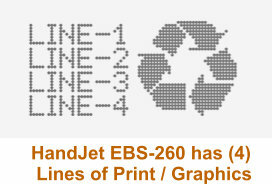 Take your day to day business activities to the next level with an EBS 260 Handjet today. A Mobile Electronic Number Stamp for Product Marking or Large Parts Marking applications. All you need for precise, Fully mobile, Number, Time, Date Stamp imprinting. Simply "Press" the Black Button to activate printing for non-contact printing on flat or uneven surfaces...THEN, start rolling the EBS-260 , by making contact with the stabilizer wheels onto the surface being imprinted. A total of (10) Imprint Layouts can be stored and recalled in the unit (1,500 character(s) per each of the (10) imprint layouts). Print on any absorbent surface. Print on any non-absorbent surface. Reliable Print Performance - suitable for harsh and dirty environments. **Ink Colors are NON-Interchangeable. Only one Color Ink can be utilized in a Handjet Printer. Automatically advances the Time, Date and Numbers internally. Variable Print Data can be configured; Counters, Expiration Dates, etc. Complete HandJet EBS-260 Inkjet Coding Printer Kit includes; (1) EBS-260 HandJet Printer with carrying case, (1) Configuration Software, (1) USB Bluetooth Module, (1) USB Cable for module, (1) Black Acetone Ink Jet Cartridge, (1) Power Pack and cable, (1) Spray Bottle, (1) User Manual. Applications: A Totally mobile Solution for Time Date Numbering, and Graphics...uses such as; Parts Marking, Package Marking and validating in product manufacturing processes, and packages in transit, quality control validation, laboratory timing and checking, production controls, large product marking and where part marking needs to be performed in dusty and dirty environments. **Radio Frequency usually operates up to only 150 Feet. Transfer of imprint layout(s) and backup of configuration. **Optional Stabilizers may be required to acheive optimal Imprinting on Curved Surfaces! Utilize the EBS-260 HandJet for InkJet Coding on Concrete Pipe Product Marking, PVC Pipe or Tubes and Steel Building Materials or packaging. Textiles and Upholstery products can now be marked legiably. 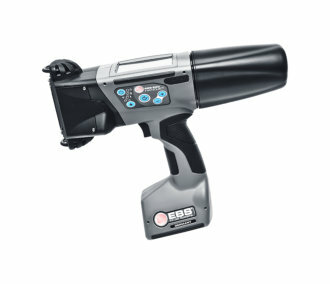 Utilize the EBS-260 HandJet for InkJet Coding in the Timber Industry on Wooden Tree Trunks, or to code Wooden Shipping Crates, imprints for traceability in warehousing and when the product marking is to be imprinted on curved containers such as paperboard cores and mammouth sized items anywhere. 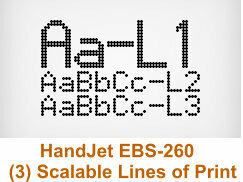 Watch this video to see the HandJet EBS260 InkJet Coding Printer in action. Ink Cartridges: Water based, Ethanol, Acetone in various colors. Print Timing Speed: Synchronized with rotational speed of lower stabilizer, or at intervals by an internal generator. Humidity: Up to 95% non-condensing: printer will operate in rain, (surface being imprinted must be dry). Storage Temperature, for water based inks: 34F degrees to 113F degrees. Storage Temperature, for ethanol or acetone inks: 14F degrees to 113F degrees.